Melchior de Hondecoeter was a painter who specialised in depicting birds of all types. He began his training with his father Gijsbert, who also painted animals, as did his grandfather Gillis. Hondecoeter continued his training with his uncle, the famous artist Jan Baptist Weenix, whose technique and use of colour is evident in his own style. A perceptive observer, Hondecoeter generally depicted domestic and wild birds, painted with great accuracy with regard to their plumage and with subtle nuances and a mastery of textures that won him great renown. His skill in this genre is evident in his marvellous studies of the birds’ movements as they walk, turn, fight, eat, scavenge or simply stand immobile against a landscape background. This type of painting was highly appreciated in its day and was purchased to decorate middle-class mansions and aristocratic country residences. 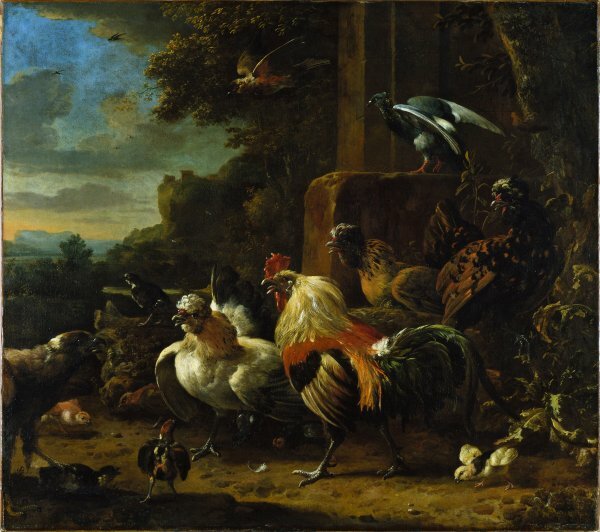 Among Hondecoeter’s most prominent clients was the Stadtholder William III, who commissioned a canvas for his hunting lodge depicting a Pelican and other Birds by a Reservoir (Rijksmuseum, Amsterdam). In the present canvas three hens and a cockerel confront a bird of prey that has got into the hen coop. This was a recurring motif in Hondecoeter’s work, which he used to create a more dynamic mood and introduce a note of tension that allowed him to depict the birds’ reactions. In general the artist structured his compositions with a large group of birds in the centre with others on either side whose bodies are truncated by the edges of the canvas. For his settings he used walls, fences and other structures such as blocks of stone or masonry to construct a wall against which he set the principal motif, with a balancing area of landscape on the other side and in the background. This type of composition, typical of the 1660s, was inspired by the Flemish painter Frans Snyders. Hondecoeter’s output is extremely large and difficult to date as he signed very few works and repeated his compositions with variations. Two copies are known of the present canvas, as well as a replica and two variants. The canvas was in the UK in the early 20th century in the collection of Baron Belper. It was auctioned twice at Christie’s in London in 1919 and 1930, and was purchased at the latter auction by Fleischmann in Munich, from whom it was acquired by Heinrich Thyssen-Bornemisza. It was included in the 1930 exhibition at the Neue Pinakothek in Munich.